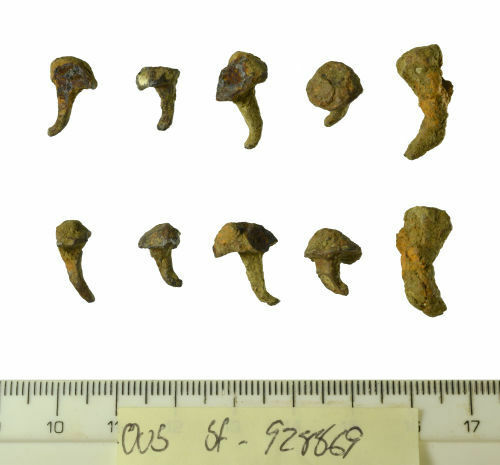 An assemblage of 5 iron nails of Roman to Post-Medieval date. They have a combined total weight of 7.03g. 1) It has a circular domed head. On the back face is an integrally cast rivet. This is trapezoidal in section and tapers to a point. This nail measures 8.26mm in diameter, 14.46mm in length, 2.47mm in thickness, 0.89g in weight. 2) It has a circular domed head. On the back face is an integrally cast rivet. This is trapezoidal in section and tapers to a point. This nail measures 8.18mm in diameter, 11.27mm in length, 2.40mm in thickness, 0.73g in weight. 3) It has a circular domed head. On the back face is an integrally cast rivet. This is trapezoidal in section and tapers to a point. This nail measures 10.84mm in diameter, 16.02mm in length, 3.55mm in thickness, 1.59g in weight. 4) It has a circular domed head. On the back face is an integrally cast rivet. This is trapezoidal in section and tapers to a point. This nail measures 10.56mm in diameter, 11.90mm in length, 2.90mm in thickness, 1.25g in weight. 5) It is T-shaped with a flat rectangular head. On the back face is an integrally cast rivet. This is rectangular and tapers in thickness towards the base. This nail measures 18.86mm in length, 9.28mm in width, 4.02mm in thickness, 2.57g in weight. These nails may be hobnails or upholstery nails. There is a similar example recorded by Manning (Manning, 1985, p. 136, no. R102).